The HP Indigo photo prints solution is available with the HP Indigo WS6000p Digital PressAt photokina 2012 HP demonstrated new solutions for professional portrait and consumer photo prints using HP Indigo Digital Press technology as a replacement for traditional silver halide (AgX). The new end-to-end solutions are designed to offer photo labs a high-quality, economical alternative to AgX technology for low- to high-volume photo prints. Also on display were HP's digital printing technologies for the photo market and a full range of photo applications, including sample output from the HP Indigo 10000 Digital Press. "As the photo market leader, HP provides solutions that respond to today's market needs, allowing photo labs to print both high-quality photo prints and merchandise," said Alon Bar-Shany, vice president and general manager, Indigo Division, Graphics Solutions Business, HP. "The new silver halide replacement offerings create a unique opportunity for photo labs to provide photo prints at a lower cost than traditional silver halide and with a clear environmental advantage." In addition to new solutions for photo lab environments, HP also announced new photo creation software and same-day creative output products at the exhibition. The new HP Indigo photo prints solution brings HP's high-quality liquid electro photographic printing technology to the professional portrait and 10 x 15 centimetre (4 x 6-inch) consumer prints markets which the company claim offers the same quality as silver-halide. For high-volume production, the HP Indigo photo prints solution is available with the HP Indigo WS6000p Digital Press, which is already used by many photofinishers to produce high-quality prints. The new solution includes an optional in-line GMP LAMIMASTER 34 and in-line cutting and stacking solutions from Tecnau and Hunkeler. For low- to mid-volume printing, the solution is also available with HP's sheet-fed digital presses, including the new HP Indigo 5600 and 7600 Digital Presses. It can be configured with an optional GMP PROTOPIC PLUS-540 laminator for professional portrait quality with luster effect or glossy finish for consumer prints and a cutting and stacking solution from Rollem. The HP Indigo photo prints solutions support a range of HP Indigo-certified photo media, including photo paper from leading vendors, including Mohawk, Mitsubishi and Felix Schoeller. 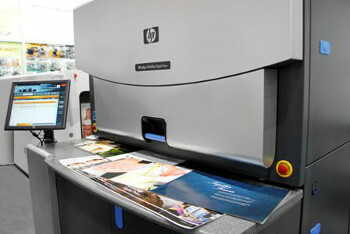 At photokina, HP displayed its broad range of digital printing systems for the photo market. • HP Indigo 7600 Digital Press, which features new effects for creating high-value photo specialty applications. • HP Designjet L26500 Printer, a 1.55m (61in) large-format printer using HP Latex Inks for the production of indoor and outdoor graphics. • HP Designjet Z3200 Photo Printer, a wide format inkjet printer with a 12-ink printing system for professional photographers with built-in spectrophotometer. HP also featured applications demonstrating the latest techniques available using HP inks, substrates and technologies, including sample output from the HP Indigo 10000 Digital Press. The B2 size format press (740 x 530 millimetres [mm] / 29.5 x 20.9 inches) enables new oversize photo applications such as photo books, book covers, calendars, and posters, and efficient production of standard-size photo products. Visitors to photokina saw the world's largest lay-flat photo book, which measures nearly one metre (39.37 inches) wide when opened. The hardcover, leather-bound book, which was designed by MediaClip, was printed on the HP Indigo 10000 and finished by Loxley Colour. To help retailers achieve growth and meet customer needs the company highlighted the HP Photo Center 7 software upgrade which can unlock the billions of photos stored on social networks and mobile devices, making them available for in-store photo and photo creative merchandise purchase. It said HP kiosks running Photo Center 7 will offer direct access to photos stored on Facebook, as well as plug-in connectivity that allows shoppers to immediately download photos from their iPhone or Android smartphone. The company pointed out that the software also allows retailers to compete with online photo publishing services by offering an expansive portfolio of photo creative merchandise including photo books, greeting cards, posters and calendars, as well as new products such as HP Canvas, HP Faux Canvas, HP Mounted Photos and HP Custom Cover Photo Books - all available the same day as they are ordered in-store or online. It added that for the first time, HP Custom Cover Photo Books will be available for same-day ordering in-store or online. Customers can choose a favourite photo to feature on the book's cover and add text to both the cover and the spine. These will be available to retailers worldwide in spring 2013. Additionally, HP is introducing a portfolio of same-day wall art decor products, enabling retailers to offer personalised photo wall art at a variety of price points. • HP Mounted Photos, a ready-to-display photo décor product that can be hung on the wall or propped up on a table or desk like a picture frame. • HP will also offer a same-day mounted photo service.